The finishing touches are being put on Behind Closed Doors, an original production at the Bella Rose Arts Centre. The play opens Friday night and examines teens facing complex lesbian, gay, bisexual and transgender issues. These are all lines in the upcoming performance of Behind Closed Doors. The play was written by two students from Halifax West High School who approached Edmund MacLean, the fine arts specialist for the Halifax School Board, last May with their idea. 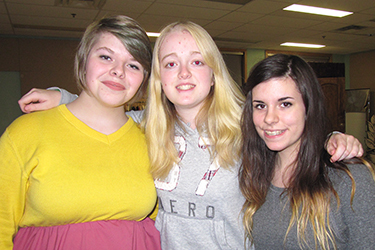 Jodi Miles, 18, and Nikki Giles, 16, co-wrote and are co-directing the play which has about 30 students taking part. Miles has worked closely with Gay Straight Alliance and human rights issues. The play has brought together a wide group of people who would normally never talk to each other in the halls and has allowed them to bond and become each other’s friends, says Giles. MacLean takes great pride in the student-driven production. “They’ll be stronger for talking about tough issues. No one will be able to touch them after this,” says MacLean, who sees the importance of tackling issues surrounding kids being bullied because they are different. He says ignorance creates fear, and when ignorance and fear come together, “horrible things can happen.” MacLean says the play will enlighten and educate. The Act further outlines the importance of equipping students with knowledge, skills and attitudes necessary to make their school community equitable for all individuals including lesbian, gay, bisexual, transgender, transsexual, two-spirited, intersex, queer and questioning. Producer Emma Alderman is in Grade 12 and says for the most part her school is a “safe place to come out.” She says there are still some people who are ignorant about these issues and she would like them to watch the play and get a better understanding towards the LGBT*Q community. Proceeds from the production are going to support Youth Project, a non-profit charitable organization that provides support and services to youth ages 25 and under who are dealing with sexual orientation and gender identity issues. Footage from dress rehearsal of student-driven play addressing tough issues facing LGBT*Q community. Edmund MacLean describes his experience working with the students on such an important project. In the last six weeks between three and six Mount Saint Vincent University students have taken excessive quantities of over-the-counter pain medication to cope with stress and anxiety. “That’s too much, that’s way too much,” says Lynn Cashen Basso, housing co-ordinator at MSVU. Cashen Basso says she’s seeing an increase in large quantities of Tylenol and Advil usage by students who do not consider themselves suicidal, but rather see themselves in need of some help to cope. They’re ”taking the pills to numb the pain and make everything go away,“ says Cashen Basso, adding that students don’t understand there are larger consequences to those actions. Mental health issues such as anxiety, self-harm and pill over-dosing have been increasing dramatically over the past 10 years. 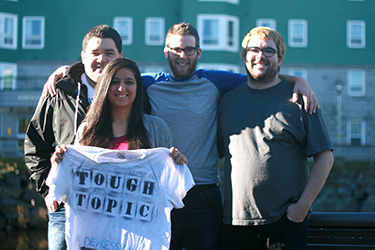 Students at MSVU have created a campaign to break the stigma around a wide variety of mental-health issues. The Erase the Stigma campaign was created on a sunny Sunday afternoon, less than a month ago, when a group of student dons and residence advisers (RAs) came up with the idea of making a video. The project aims to let students know it’s OK to talk about depression — that it’s good to talk about self-harm, obsessive compulsive disorder, suicide and other tough issues affecting many students on campus. 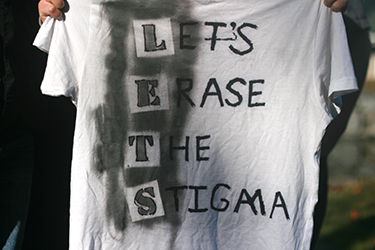 The Erase the Stigma video launched last Wednesday on YouTube. T-shirts and buttons were another aspect of the campaign. Participants each chose a tough topic they were passionate about and wore it on their T-shirt. Alissa Ali, a student don on campus, chose depression. Cashen Basso says she tries to educate students about the severe side-effects an overdose can have on their internal organs. MacDonald says there’s a lot of misinformation amongst students around pill usage. “Students don’t see the long-term affects of impulsively swallowing a half a bottle of Tylenol”, he says. It’s not until six hours later “they’re saying they’re not really trying to kill themselves, they’re trying to make themselves feel better.” MacDonald says the misinformation lies in the fact they’ve taken more than enough pills to kill themselves. Matt Morash, an RA, says wearing the shirts around campus, having the video and having people ask questions, has generated awareness. “Every conversation we had with someone was one they wouldn’t have had otherwise,” says Morash. Joey LeBlanc, an RA, says wearing their T-shirts on the same day the “I’m feeling” campaign kicked off, “helped to generate more chatter around difficult mental-health conversations. “The “I’m feeling” campaign is in it’s second year and is run through the student union. A group advocating for safe and affordable housing released reports Thursday suggesting that 27 per cent of homeless people in Halifax are young people. 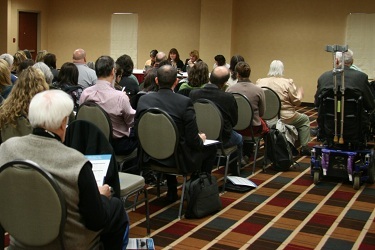 The Nova Scotia Housing and Homelessness Network released two reports on homelessness in Halifax at a downtown hotel on Thursday. Young women represented a dramatic change in those accessing shelters. Since 2009, females who have stayed in shelters between the age of 16 and 19 have increased 284 per cent. Homeless advocates say a small portion of the homeless young people are attending university. More than 75 people — including community, health-care workers and media — filled the conference room at the Four Points by Sheraton Thursday morning for the first day of a two-day conference. The conference aims at creating discussion around the change in homelessness, housing and income in Halifax, with the goal of creating enough stable housing for all Nova Scotians by 2022. Over the past three years, the Halifax Report Card On Homelessness 2012 indicates the number of homeless people has risen despite 240 people moving from shelters into permanent housing. The number of individuals who stayed in a shelter increased 14.8 per cent from 2009 to 2011. Independent researcher Charlene Gagnon, the lead analyst of Health and Homelessness Network, says the reports were created to help bridge a gap which exists in collecting data on homelessness across the country. Pamela Harrison of the Homeless Individuals and Families Information System described the increase of homeless people in Halifax as only a slice of the real number of homelessness. She says the actual number of people accessing shelters is more than 4,000 — including those who access shelters, leave to find housing, and return due to the of lack of options. Gagnon says the report found of the 127 people interviewed in January 2011, “69 per cent said that the main reason they were still homeless in the city was because of lack of affordable housing options for them to access.” Half of the people interviewed live on less than $200 a month, says Gagnon. One new factor examined in the report was age. While more than 50 per cent of the homeless individuals interviewed were between ages of 26 and 49, the report found 27 per cent were youths between 16 and 25 years old. Of the people surveyed who were homeless for less than one year, 41 per cent of them were youths. Homelessness exists within the universities and occurs “when students come from home and don’t have anyone to support them,” says Harrison. If “(students) don’t know how to manage money,” they start accessing food-banks and health services more frequently. Harrison says some students “are overwhelmed and drop out and end up in a shelter.” She says youth services need to enable these students to get back functioning within society. While the report did not specifically target university students and homelessness, Harrison said people need to understand not every single university student is the same. “When you look at somebody next to you in the classroom, you don’t know if they have a home to go home to tonight, you don’t know if they’re living in a shelter, you don’t know if they have family that is sending them money if they need it,” says Harrison. Patti Melanson of Mobile Outreach Street Health says she met a Dalhousie student less than a week ago who had lost his accommodation and is now staying in a Halifax shelter. In these instances, Melanson says shelter usage is usually short term. It’s difficult to track the real numbers of students affected by homelessness. Jean Hughes, a nursing professor at Dalhousie and a research contributor on the report, says some students find themselves homeless and “couch surf, staying at neighbours or friends, but not having one secure place to live.” She says life is extremely difficult for homeless students desperately trying to get their degree. Wendy Fraser the director of women’s services at the YWCA Halifax says there are currently five women staying in shelters through their housing programs, who are currently working towards their university or college degrees. It’s great that students volunteer but they “can’t be in fix-it mode all the time,” she says. Halifax city council voted against sending the Skye Halifax project to public hearing on Tuesday. 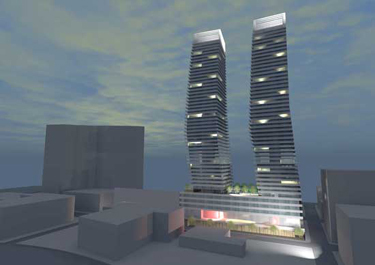 The 48-storey Skye project — proposed by developer United Gulf Development — was to be built on the old parking lot on Sackville Street between Granville and Hollis Streets. Skye would have included 600 residential units in its 172-metre-high towers. The units could have offered affordable housing to young buyers interested in living in the downtown core. Councillor Brad Johns recognized the demand for affordable housing downtown, but said it’s not a justifiable reason to move forward with the project. Johns said council should address the pressing issue of affordable housing and that it should not be used as criteria for supporting Skye project. “We’re putting all our eggs in one basket by having development all happen in that one building,” said Nicoll. She would like to see development dispersed evenly downtown and not all in one place. Richard Harvey, the acting urban design project manager for the HRM, voiced concerns from the design review committee about the effect the project would have on the streetscape environment and the loss of sky-view. Harvey recommended city council not move to a public hearing. Dartmouth councillor Gloria McCluskey voted to push the project to a public hearing and stressed the importance of “hearing from the residents first hand.” McCluskey questioned why council is afraid to hear from the public. While she may not agree with the project, she said it’s not up to her to decide, it’s up to the people. Downtown councillor Waye Mason urged council to vote yes to halting the development. He said there is a need for clear and consistent rules for downtown development and the decision is about trust. Councillor Jennifer Watts agreed with Mason and said the development was not in the best interest of downtown Halifax. “I wouldn’t mind seeing a couple of twin towers in the city,” he said. Mayor Mike Savage joined the debate saying the decision was not about the height of the project, urban density or vibrancy in the downtown core, but about whether or not council is committed to following a plan. Looking to the future, Watts said planning staff need to focus on an urgent plan of action for developing downtown Halifax — one that is desperately needed in the urban core. 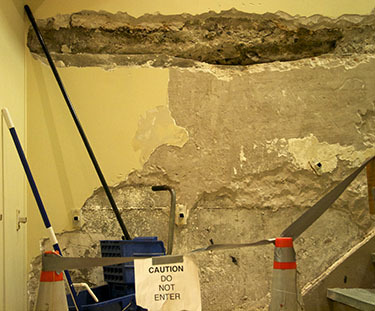 King’s students are curious about the growing hole in the stairwell in the main building on campus. The hole is taking on a life of its own. There’s no point in putting the mops away until maintenance finds the source of the flooding. Water has been pooling up behind closed doors for some time. The King’s Student Union (KSU) found their storage room completely flooded last month. They had been using an old laundry room in the building’s basement to store boxes of files and records — records which were used by the university’s Wardroom pub, KSU and the Galley canteen. The room was opened last month and found to be completely flooded, with most of the materials ruined. “We had a day to remove all of our boxes. They were rancid and full of flies,” says KSU Internal Co-ordinator John Adams, who believes the water had been in the room for awhile, given the condition of the materials. The remaining scraps of event materials, record books and files are piled in a small corner of the KSU office. UNews is awaiting comment from the university’s maintenance crew on plans to fix the leak.